But it would have been better if you made the file path platform neutral, what you have there is Windows specific. Although it works, it will need tweaking before it can run on Linux and Mac OSX. Helen, thanks for the good words and thanks for the tip! As you said the path really is set for my machine, for Windows. As this is just an example I think it will be better for the people using it to set the path their selves. One reason, as you said, is about the specific OS, another reason the writing permissions the user has over the folder and off course the desire where to put the temp files. I will leave it that way, but will add comment in the code to change the path. thank u for ur article. Actually, that's a good idea. It provides the users the opportunity to make it run on their individual platforms. Again it allows beginners to get their hands dirty – in the process learning between Windows and Linux file systems in Java. Congratz Tony… very good post, help me alot! thank you for this quick tut! I was wondering if I had to first send each file from Flex client to the server(to be treated as mail attachments), and then send the text (to be included as the mail body) and then retrieve all the files sent earlier and finally assembling them all to send the mail. Your article gave me great pointers to send them all at one go. very nice blog. 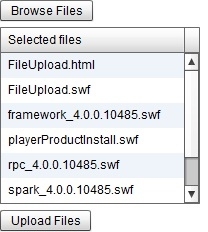 but I have problem as I am using Flex-Spring-BlazeDs sdk 3.5 and its a project need. .load() could not get recognized by compiler. so I tried with upload() with .cfm file but still I not able to solve it. I will really appreciate if you give some example of this case. Adi, load() is supported in FlashPlayer 10 and up. The problem is not in the sdk, but the player version. And the corresponding java side property for the Dto is “public byte logo;”. While transferring this dto from flex to java, blazeDS fails and below log is displayed on the blazeDS side. [BlazeDS]Creation validation for class '[B' failed. flex.messaging.io.SerializationException: Creation validation for class '[B' failed. flex.messaging.io.SerializationException: Creation validation for class 'com.brocade.dcm.vmplugin.service.layer.model.NetworkAdvisorServiceRequest' failed.